The Insa Turbo Dakar is the tire Off-Road of 4x4 high performance. The most advanced R&D has allowed to Insa Turbo to make this last trend tires range applying the last technologies in the renewed tires production. The result is an excellent performances product that has an excellent stability and adherence as much in road and as in steep and sheers areas. 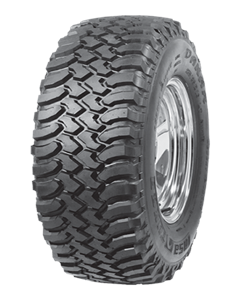 Designed to face all kinds of weather conditions, it guarantees a high performance in the hardest handlings, being a strong, resistant tire and with an excellent crossing obstacles capacity. The width and deep tread reduces the wear and improve traction out of road. The small off-roads in the treadimprove the handling and the brakingcapacity. The aggressive profile of big blocks placed on the shoulders offer a great mobility in sand, mud, rocks, etc. The great hardiness and solidity of its structure provide exceptional external aggressionsresistance. The variable disposition of the off-roads reduces sensitively the noise. The ecological tire Sahara is made under the most advanced R&D, using Insa Turbo's last technology, developed in its own innovation centre in Aspe. Likewise, it offers better grip and less rolling resistance in the driving and at the same time contributes to the environmental care.